Crank Crank Revolution: Badges? BADGES? I am a sucker for treasure-hunter stories, though I tend to prefer books over the film. (Most treasure hunting stories are made in the journey, and most movies just want to get to the exciting part where treasures of glistening gold are found in remarkably well-preserved chambers. Books take their time getting to the goods.) Still, good ones that aren't horrid action films disguised as treasure films are fairly rare, so I grab onto them when I can. Humphrey Bogart is not a pretty man. Standards must have been much lower back then. I apparently was under the impression that this movie was more modern. I wasn't expecting a black and white movie. Not sure why I thought differently. 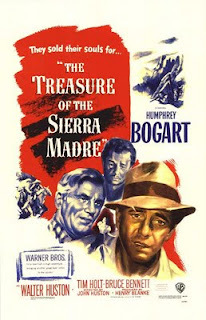 Surprisingly for an older movie, it does not rely on a huge number of treasure-hunting cliches. In fact, this is less a treasure-hunting movie than a western gold-prospecting movie. They make the prospecting out to be exactly how it is--boring and uninteresting. They have plenty of gold dust, but no shiny coins or sparkly nuggets to hold up to the camera: it's just the slow drudgery of slopping through mud and mind-numbing routine. One thing I don't know is exactly how this movie handles the standard formula for this sort of thing. I've seen enough westerns to know how Mexicans and Indians get portrayed, and this movie is no exception: the Mexicans are either authoritative Federalis or bandits, while the Indians are still playing the part of the easily-impressed welcomer of the great white hope. Still, the fact that significant parts of the movie are shot in Spanish with no subtitles, and aside from the cartoonish bandit leader most of these characters are played reasonably sympathetically seems very refreshing. Still, I don't know how often Hollywood did this sort of thing vs. the noble savage and poor bandit stereotypes that were typified in most popular westerns. About the only true cliche is the "old prospector" of Walter Huston, who while being exactly the elderly, toothless, jig-dancing coot we expect old prospectors to be, he also manages to make the character deep and compelling. He won an Oscar, deservedly so. Speaking of, that picture of Walter Huston on the poster above makes him look like he's about to attend the governor's ball. Place him in a heat lamp for six hours and hide all his razors, and you're about a tenth of the way to making him as grizzly as he is in the film. He dances a jig. Robert Blake's performance as a small lottery-schilling child is simply to die for. Of course, the end of the movie provides us with a fairly comprehensive study in life and philosophy. It represents the three ways anyone on this earth can end up: dead from your own greed and paranoia, living it up under false pretenses and blind luck; or off to make sweet love to a widow while you grow peaches.